I haven't worked out the details, but it seems like it might be possible to apply Drag and Drop Robot to get generated mp3 files to play. I have had a video file sitting on my desk for months, waiting for me to get round to extracting the sound file. Too next to no time to deal with it. Oh! Ive been using this for a few years now, thank you! I have version 1.0.0.1 on the box now. Now do I understand that this is a repackaged mencoder.exe? Also I have always been surprised that the output bitrate is not adjustable and is not discussed or mentioned, not here in the thread or in the package. Does it copy the bitrate from the source? Maybe this could appear in config.ini. Sorry if I've missed something. Yes, this packages mencoder.exe within the video2mp3.exe file. The output bitrate is currently non-adjustable (defaulted at 160 kbp/s) because that is what the OP (original poster) wanted for his sister. Until ewemoa's request for a specifiable output directory, this app didn't even have an INI file. From what you have described above, I guess you may need some kind of video converter which asks you to add video URL and then you can download mp3 straightly. Another method to rip mp3 from video automatically is that you could try to use some audio recorders to record audio streams as mp3. this app didn't even have an INI file. May I ask if you can add one so that we're able to overwrite the default value of 160kbit or as an alternative to add it to the cli syntax (e.g. "-bitrate 192")? Here you go. See included help.txt file for instructions. 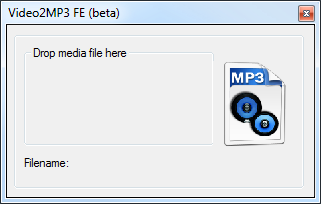 + Added ability to specify audio bitrate of generated MP3 files. You're welcome. Did you have a chance to test it out? What video formats are accepted? Thanks. Uhhhh...anything that mEncoder can process? I've tested with FLV, MP4, AVI, and MKV. Feel free to try whatever, though. Ok, thanks. That's helpful. The reason I asked is because when searching for converter software and narrowing down the field to the ones I want to try, the versatile ones are more attractive. I didn't see anything mentioned here. Ah, yes ... sure enough, that's basically what it says in the OP. Heh, I didn't take that into account Even so, the question of input formats was still open. But universality could be reasonably assumed given the no-brains, no-fuss goal of the program. Even so, the question of input formats was still open. Agreed! I'm lazy. Hahaha. For the record, the mEncoder binary does the grunt work of this app and it seems to support just about any format I've thrown at it. can I use it to save the video and discard the audio? No, that's not the purpose of this application. Hi again Jody, I just had cause to use your little app on a massive video file - 4+ Gb in MKV format however dragging it onto this utility yields the *no-go* icon (circle with a line through it). As you mentioned it supports MKV I'm wondering if something else might be preventing it from looking at the MKV i tried - maybe it's too big? I tried a few others - all are huge MKV files and none of them would *drop* on this app. PS: Just tired it with a few other MKV files, small ones, and the same thing happens - the app refuses to accept them when trying to drop them onto the app's window. I assume that there must be something about the MKV itself that it doesn't like but I dunno what. Are you running it from a UAC protected folder? That's about the only thing I can think of. I just tested it with a six gig MKV and it seemed to work. That said, I never really designed this app for such large files. It was initially made for small YouTube clips so you might be better served using one of the more full featured video-to-audio converter programs out there. There are a myriad of them for sure. I appreciate the sentiment, but Video2MP3 was written for a specific request by the original poster and, thus, is extremely basic and barely configurable. It will remain that way because there are innumerable other more capable media converter apps out there that I just do not see the need to write an interface for Video2MP3. @c.gingerich pointed out one above but that is just one of MANY. I appreciate your feelings skwire. using video2mp3 via sendto menu is a good enough workaround for me. To keep an open mind, i will try format factory. Thanks guys! I have a basic drop window for my personal usage. it has no function of its own other than to pass the filename to skwire's app. if you want, i can post it here.